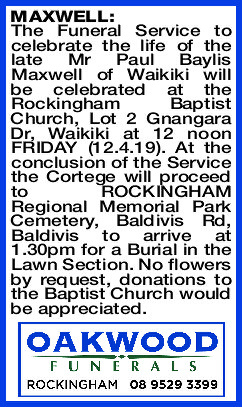 The Funeral Service to celebrate the life of the late Mr Paul Baylis Maxwell of Waikiki will be celebrated at the Rockingham Baptist Church, Lot 2 Gnangara Dr, Waikiki at 12 noon FRIDAY (12.4.19). At the conclusion of the Service the Cortege will proceed to ROCKINGHAM Regional Memorial Park Cemetery, Baldivis Rd, Baldivis to arrive at 1.30pm for a Burial in the Lawn Section. No flowers by request, donations to the Baptist Church would be appreciated. To my Dearest Dad, I will miss your love and support and most of all I'll miss the mutual understanding and closeness of just sitting quietly together. Thank you for your unconditional love and support. Sleep peacefully in the arms of our Lord. Deeply loved, you will remain forever in our hearts. (One of Life's true gentlemen). Love Terrie and Paul, Jayke, Deb, Deegan, Bohdi and Van, Cody, Shoo and Ash, Sophie, Kaelyn, Quade and Jamal, Luke and Emma xxxxxxxx. 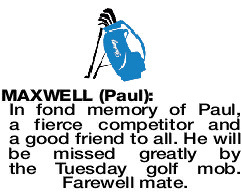 In fond memory of Paul, a fierce competitor and a good friend to all. He will be missed greatly by the Tuesday golf mob. Farewell mate. 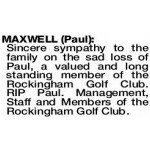 Sincere sympathy to the family on the sad loss of Paul, a valued and long standing member of the Rockingham Golf Club. RIP Paul. Management, Staff and Members of the Rockingham Golf Club.